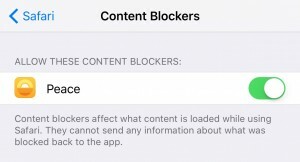 Yesterday, Apple released iOS 9, which adds the ability to do “content blocking” to Safari and most other apps that show web content. Not coincidentally, dozens of content blocking apps were also launched, most focused on eliminating web ads. Then the Internet exploded as ad-supported content creators squared off against hordes of angry users who saw the beauty of an ad-free mobile web experience. At the center of this skirmish was Marco Arment and his ad-blocking iOS app, Peace. Marco created a simple and highly-effective app that leveraged the Ghostery database of web ads, trackers, and other cruft. The availability and efficacy of Peace was touted by influential folks and it quickly rose to be one of the top-selling apps in the iOS app store. I bought it, I loved it, and I shared it. Then a funny thing happened: The pundits realized that ad-blocking software might threaten their ad-supported livelihood. And they turned against ad-blocking generally (and Marco specifically) in droves. Suddenly Apple and Marco were going to kill the web, sending the children of good and noble content creators into the streets, penniless, shoeless, and hopeless. Web advertising was always a faustian bargain – No one would agree to be party to today’s ad-supported web, but they’re opted in by publishers who want the money. The annoying and misleading images are only the visible face of a privacy-invading machine that tracks everything we do online. Web ads are awful – Users hate ads and have trained their brains to ignore them, so advertisers resort to ever-more intrusive and obnoxious ways to collect clicks. Too many web sites are simply honeypots to collect as many “impressions” as possible, and even the “good” sites are littered with trackers. It’s a bottomless barrel – The intermediaries who place ads on the web sell unfilled “inventory” to others, further down the stack. Even if a publisher wants to avoid the bottom of the barrel and place only good, relevant ads on their site, they have no control over the secondary and tertiary market for their space. The dregs will surface, and they’re pretty horrible. The ad-supported web is untenable – Ad revenue has declined so dramatically that it’s almost impossible to build a sustainable business based on web site display advertising. A publisher has to be lean or mean to make it work, but how long will it last? Everyone who lives in this ad-supported world understands these things but they live with them because the lure of money is too tempting. A few have broken out of the mold, trusting good ad networks like The Deck, making a living off feed sponsorships like John Gruber, or selling value-added services like Ben Thompson. In our niche of enterprise IT, there has been almost a decade of head scratching by bloggers and would-be advertisers alike. How should a storage or networking company advertise? Should a niche blog have ads? Enterprise IT companies can try to go through the big, conventional display ad machine, buying impressions from the big guys. They’re hoping that the vaunted targeting capabilities work, and aren’t just corporate spam like a billboard at an airport or logo on a Formula One car. They can also buy ads on individual sites, but it can be tedious to work with dozens of individuals and the results can be hard to measure. Many bloggers just threw up their hands and removed the ads from their sites. The income just wasn’t worth the effort. Some also faced the backlash from readers who were exposed to poor or misleading ads washing up from the bottomless barrel. And then there was the criticism they faced when readers assumed that an ad would tilt the balance of their editorial independence. When bloggers ask me about web advertising, I like to share my own experiences, which have mostly been negative. I removed all of the ads from my sites and focused instead on value-added services. But curated ads and relevant blog sponsorship isn’t a bad idea, as long as everyone strikes a realistic balance between revenue and outcome. Regardless, I’m not at all worried about the rise of web content blocking generally or ad blocking in particular. It’s just not my battle. Is your blog inviting or forbidding? People write blogs for a multitude of reasons, ranging from crass commercialism to noble information-sharing. But every blogger succeeds or fails based on the interest of their readership: Lose your readers and you’ll literally be talking to yourself. Speaking as a former magazine columnist and feature writer, I can assure you that blogging is a special beast. We must always focus on making our blogs easy to discover, read, and share. Here are 9 ideas to help your blog be more successful! 1: No More “Me-Too” Posts! If one of your peers already posted pretty much all you have to say on a topic, don’t post at all. There’s no law saying you have to immediately comment on every piece of news, and your readers are probably reading the other guys’ blogs, too. If you’re a worthwhile writer, there has to be a unique angle you can use for any story. Find your own voice! Bonus hint: Make sure you are reading your peers’ blogs so you know what they are saying, and a link back to them wouldn’t hurt either! If you’re still cutting off your posts after a few sentences, you’re losing readership. Many readers won’t click through on two-line feed items and feel burned when they bother to subscribe to these. Half the time the heading and excerpt promise more than the article delivers anyway! Switch to a full-text feed so readers can view your content right there in Google Reader, Pulse, FeedDemon, and the rest without clicking through. Although many believe they will lose readership, visitors, and AdSense revenue, they’re wrong. The best audience is an engaged one, and feed readers are the most-engaged folks you will find. They’re also a tiny tiny minority of readers (about 11%) compared to real search engine and referral-driven traffic. You’re only going to increase loyalty by switching to full-text feeds, whereas your refusal to syndicate more than 11 words is likely to drive people away. If you’re worried about plagiarism, scrapers, and other content ripoffs, there are solutions that don’t inconvenience and alienate real readers. Watch your trackbacks and referrals and set up a Google alert for your name or some other key text in every post. 3: Don’t Write “Meta” Articles About Your Site! Unless your blog happens to be about AdSense or search engine optimization, your readers don’t care about your monthly readership stats or AdSense revenue. It’s not necessary to always be 100% topical. In fact, varying your content a bit adds a spark of life and energy that many writers forget. But navel-gazing and self-congratulation isn’t going to win you any readers. Face it: You’re not getting rich with banner ads on your blog. Although ads can help offset hosting costs, keeping the lights on is about all most independent bloggers can hope for. If you decide to advertise, keep the banners unobtrusive and learn to tune your ad platform to keep them relevant to your topics. Direct ads from site sponsors are best, but vertically-focused ad networks like Fusion Ads and Daxeti (which I’m involved with) are an awesome alternative for smaller sites. Ozh’ excellent Who Sees Ads plugin for WordPress is another great idea, allowing you to only display ads to visitors from search engines. And don’t pollute your feeds with ads: Treat your (very few) subscribers like the loyal friends they are instead of trying to make a dime from their clicks. And yeah, a dime is about all you are making from your blog anyway, right? Are you illustrating your articles with 300k high-definition PNG images? Unless you’re a photographer or graphic designer, do us all a favor and limit your inline images to about 300 pixels wide. I know it’s non-free and all, but JPEG speeds up load times! And do you really need to embed flash animations, auto-playing YouTube clips, and other such junk? I’ll happily click through if I care. Keep the number of illustrations down, too. If the vertical space of your post is more than half graphics (especially cheesy Excel charts) you need to refocus it before you lose your readers. 6: Edit and format your writing! If readers can’t read your post, they won’t read your post. Start with spell check and memorize some key rules of grammar. You may be a computer genius, but readers are not going to put up with incorrect homonyms and eggcorns forever! The web demands short paragraphs with only one idea in each. Group them together into logical sections. Remember too that Google loves real HTML headers, not bold or underlined text. You can still use bulleted and numbered lists sometimes, but make sure there is enough context so the reader will be able to follow your thought process. If you’re blogging, you should control your own destiny: Have your own domain name, your own install of WordPress, and your own feed URL. It’s hard for readers to take “whoever.typepad.com” seriously, especially when, three months after they subscribe, the feed moves to “whoever.blogger.com” and they have to re-subscribe. Often, they’ll just unsubscribe and forget all about it. Even unsure newbies should register their own domain name, set up a hosting account, and install WordPress (it’s the best, hands down). They should also consider a private-label feedburner feed so subscribers can follow along even when the blog moves. Comment spam is a fact of life. Despite using Akismet, Bad Behavior, and clever tricks, most blogs get more comments from spammers than actual readers. Clear out all the anti-commenting hurdles! Install Disqus to make life easier for commenters and you’ll see quick results. 9: Let Readers Contact You! Everyone should have their real name and contact information prominently available on their blog. If you’re covering topics that intersect with work, you must disclose your employer. If you want to engage your readers, add in a link to your LinkedIn, Twitter, or Facebook account, too. But don’t go crazy – no one needs to connect to you in 800 places. Keep it simple, with just a few links and a single email address.